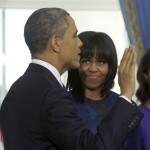 As we’re still waiting for the official proceedings to begin up on the Capitol Hill, Michelle Obama started this beautiful Inauguration Day in yet another blue outfit (she was wearing blue for the private Swearing In ceremony that took place yesterday, January 20th at the White House). 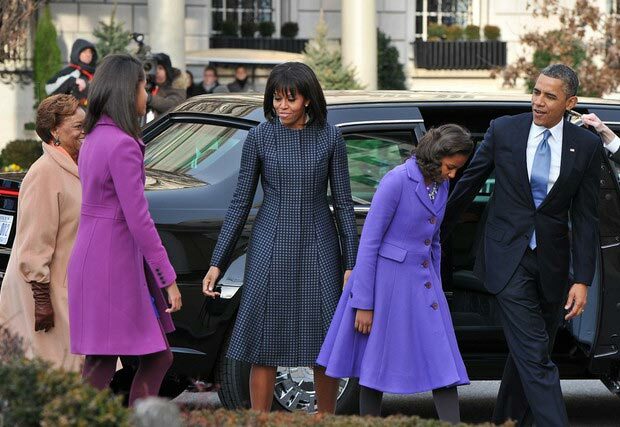 Traditionally attending the morning service at St. John’s Episcopal Church, the President, Barack Obama and the First Lady, Michelle Obama wore matching blue looks and the First Daughters, Sasha and Malia were dressed in shades of purple from Kate Spade and JCrew, respectively. But what was Michelle Obama wearing this Inauguration Day morning? Thom Browne, my dahlings! A blue coat dress signed Thom Browne with a print based on a silk necktie fabric print, as quoted by Fashionista! And as I’m typing this, actually, Michelle Obama has stepped out of the White House wearing the same Thom Browne dress I mentioned only accessorized with one of her trademark style signatures, a belt! Official reports state that the First Lady is wearing her Thom Browne blue coat dress with a JCrew jeweled belt and JCrew shoes. More, the First Lady is also wearing a Reed Krakoff cardigan and a Cathy Waterman necklace. After today’s official events, Michelle Obama’s getup (and the accessories) will go to the National Archives. They look all great! A very handsome and stylish family. 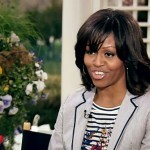 I just had some lols because three men in a Dutch programme discussed Michelle’s bangs! I swear. The reporter in Washington didn’t like her bangs! Too young looking according to him and they had to go…..??? And the other men were like “bangs”? “I wasn’t looking at her bangs…..” Some men…..I love her bangs. 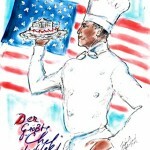 And I loved what the girls and Barack wore as well!